Like milk and cookies, fish and chips, and a copy of Ride to Hell: Retribution and the nearest volcano, hotels and Hitman go together very well. 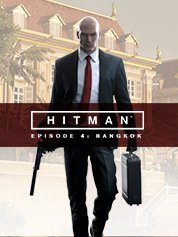 There's something about the maze of rooms, the abundance of staff, and the classy yet clandestine nature of these establishments that always make good missions for Agent 47, and the episodic game's latest, set in the classy Himmapan Hotel in Bangkok, is no different. Previous Hitman fans may recognise that Bangkok's layout and general style echoes that of the excellent House of Cards mission in Blood Money – and it does, which is almost certainly a good thing. Instead of being set in a big location like Sapienza or Marrakesh, with plenty of small buildings and alleys to hide in, all of the action this time around takes place in and around the Himmapan, making missions feel a lot more claustrophobic and stealth-focussed than any other in the game. 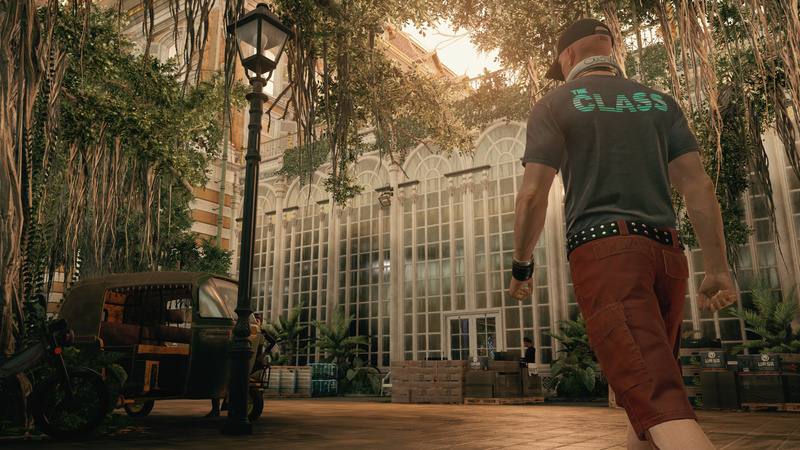 Because of this smaller set-up, Bangkok takes the Hitman concept of trial-and-error to heart – this outing is noticeably harder than other missions, with less loose disguises and hiding spots around, and a bigger security detail. Getting between floors and into restricted areas is hard without a uniform, but to get a uniform itself is even harder, and to kill your targets even harder than that. 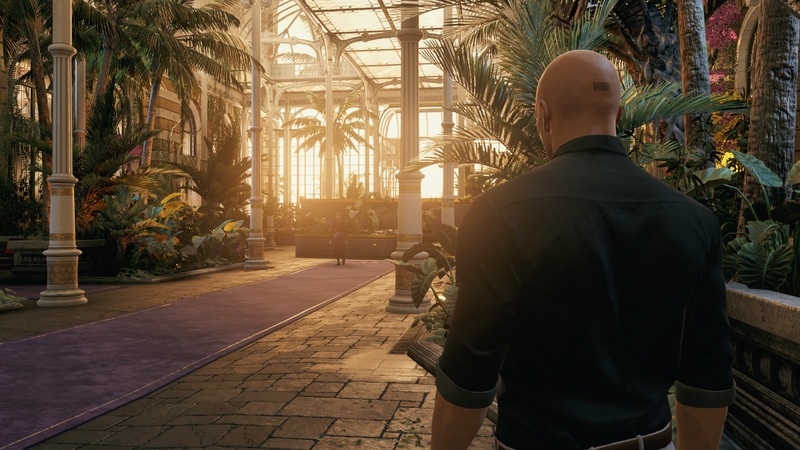 Still, that makes the kills all the more satisfying – and that's what Hitman is all about. Everything in Bangkok seems to be very dramatic, with the level going for a spy-thriller movie vibe. From your handler's theatrical opening dialogue to the striking beauty of the Himmapan and its surroundings, this episode is the pick of the bunch in terms of visual quality, with the beautiful architecture of the hotel mixing with the colourful vegetation – the mission feels ostentatious, the developers tweaking the atmosphere and the environment to a showy and melodramatic effect. While the kills may not seem as creative or ludicrous as they were in other episodes – with Bangkok probably having the least interesting assassinations in the game so far – there are a few that feel satisfying and well-worked. Killing Cross with his own 27th birthday cake is hilarious in its self-awareness, and dropping coconuts on the head of Morgan is beautiful in its simplicity, but easily the best kill involves you shooting Cross in the back of the head while he listens to a tape of him and his dead girlfriend fighting. We won't spoil it, as it's the highlight of the episode, but it's one of the best kills in the game. 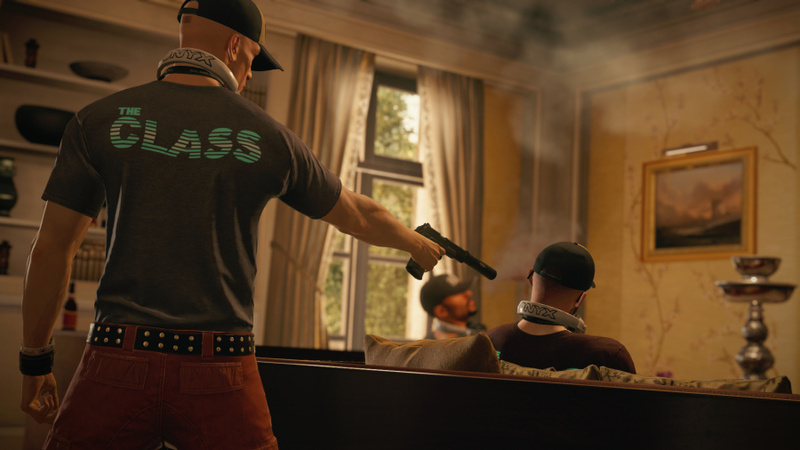 Bangkok still has a lot of the humour that makes Hitman so charming. Walking around in a servant's uniform causes one guard to say "The butler did it!" and there are many interesting exchanges parodying indie rock culture – you can listen to one obsessed fan talk over the phone convincing a friend that he isn't crazy after renting a suite in order to stalk another one of the band's members, Heidi Klum. IO Interactive seem to have had a lot of fun in crafting Bangkok (almost as much fun as the marketing department had at confusing Push Square Towers with their PR stunt), and it's nice to see Hitman having both humour and seriousness in equal parts. But the biggest problem with this episode is that it really could've been anywhere. Thai surroundings aside, the hotel feels generic enough to have been in any country, and with the characters all having US or British accents, the immersion is ruined a bit. The hotel is an excellent setting, but placing it in Bangkok is a waste – why not use the city's notorious seedy underbelly, hectic streets, and labyrinthine alleyways as a setting for an assassination? It feels like a missed opportunity, however good the mission is. 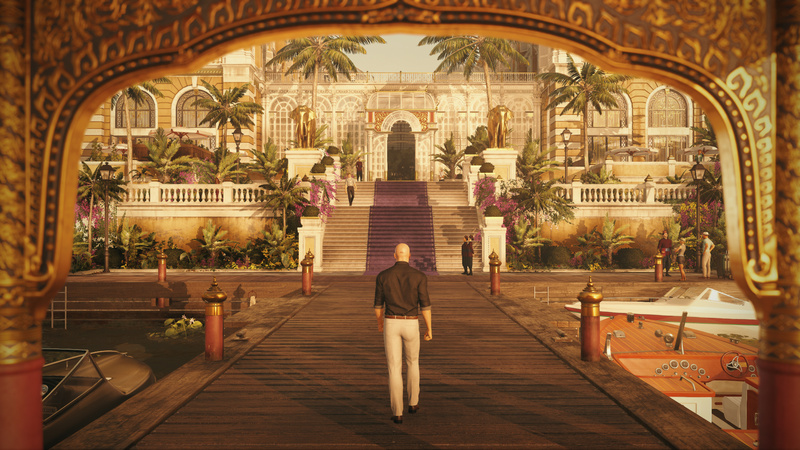 Hitman: Episode 4 - Bangkok may be weaker than Sapienza, but by no means is it a bad addition. While the setting does feel a missed opportunity, the Himmapan Hotel is ripe with plenty of different kills, and the clandestine nature and harder difficulty makes it all the more interesting. The humour and comedy is excellent as always, and while it's not the strongest level, everything feels organic, and there are plenty of hidden kills. 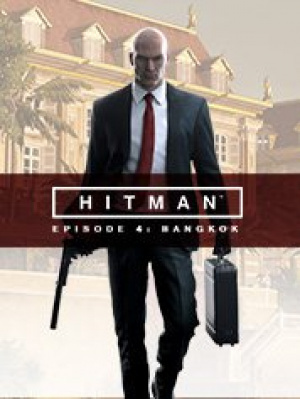 All in all, Bangkok puts Hitman one step closer to gaming Nirvana. Not wanting to make this political but when we have a society where the 2 candidates for presidency are CLINTON and TRUMP we know one thing for sure: no matter who wins. WE LOSE. @Scollurio I think that Sanders is even worst than Hillary but yeah, both are awful, USA already lost this year. I've bought this as a full game and haven't even downloaded the previous episode, let alone this - and am perplexed as to why reviewers are maintaining its very similar to Blood Money. It's nothing of the sort - it's nowhere as solid a sandbox. For me, Silent Assassin I'd still miles better than modern Hitman. Why? For a start, your actual physical presence and gunplay is supreme in that decade old game, allowing both stealth and guns blazing approach - and that approach was WAY more satisfying in how enemies recoiled, reacted and retaliated - fire with fire. This modern Hitman relies on waxy NPC'a and 47 gliding about with no real physicality to them, zero gunplay (you cannot have a gunfight if all hell breaks loose as the game simply cannot cater for it due to a lack of decent enemy AI and movement) and a lack of excitement and satisfaction in earning decent kills. Doesn't anyone else think that virtually every element of what made Hitman supreme is diluted in this version so all you effectively do is follow pre-ordained paths which actually don't vary that much? I still like Hitman as a franchise, but why IO effectively removed it's fantastic balletic gunplay as a option, for pre-tendered animation kills instead, is bizarre. Diana, 47 and us deserve better. Sort it out IO, and instead of relying on reviewers to sell a dud "you can kill them by electrocuting them here" make sure you understand that WE gamers basically read through that fluff as "here's another contextual kill opportunity, but neither these animations not kill can happen anywhere else but this spot"......sheesh, that is going backwards as a licence, NOT forwards. @Galvatron couldn't have said it better gunplay is really perthetic they should work on it but all an all I'm enjoying the game itself with the online contracts. I think Clinton's integretiy is, um, "questionable" at best, but Trump is a disaster waiting to happen, with no policies other than "Trust Me, I'm Trump, and I'm gonna make America great again" . Slim pickings indeed, and I thought we had it rough this year politically here in the UK.